Demonic dolls have been a horror staple from The Devil Doll (1936) to the recent Annabelle series. Now, the presence of evil ventriloquist's dummy Slappy (voiced by Jack Black) lends a manic, creepy edge to the otherwise tediously bland storytelling of Goosebumps 2: Haunted Halloween. The second journey into the fantasy world of novelist RL Stine initially trades in the dullest of family fare cliches. Exasperated single mother Kathy (Wendi McLendon-Covey) is the one trying to keep her mildly unruly children on the straight and narrow. Nerdy science geek Sonny (Jeremy Ray Taylor) is at the mercy of school bullies whilst big sister Sarah (Madison Iseman) is struggling with college applications and a cheating boyfriend. Everything changes when Sonny and pal Sam (Caleel Harris) discover Slappy, whose mischievous manner shifts towards the megalomaniac as he faces rejection by the family and vows to unleash all the horrors of Halloween. 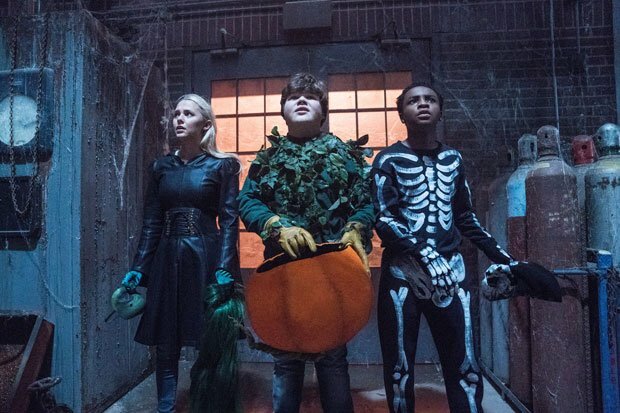 The special-effects are the most imaginative element of Goosebumps 2 as Slappy's evil plan conjures up nasty garden gnomes, belligerent razor-toothed gummi bears and a giant spider constructed from purple balloons. The latter comes courtesy of next door neighbour Mr Chu (Ken Jeong), who throws himself into the spirit of any seasonal celebration by decorating the entire neighbourhood with wild abandon. The plot of Goosebumps 2 is a strictly join-the-dots affair with external threats and family friction all resolved at the drop of a hat. Some perky performances help maintain the energy level with Jeremy Ray Taylor showing comic timing as Sonny and Jack Black making a brief re-appearance as RL Stine. The effects and the cast justify the second star of the rating along with the lurking suspicion that the whole film could just be a cunningly disguised Trojan horse satire on the relentless global commercialisation of Halloween. General release Fri 19 Oct.